Doctors use various imaging tests to see inside your body and evaluate your injuries. The most common tests to diagnose neck and back injuries are MRI, X-ray and CT scans. All of these tests are painless and completely non-invasive (they can be performed without penetrating the body). Each exists to serve a different purpose in the diagnosis and treatment of spinal injuries. 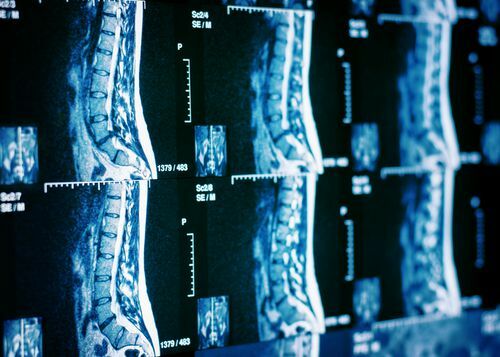 MRI (magnetic resonance imaging) tests are the best method for examining injuries to the spinal cord and ligaments. However, if you are rushed to the emergency room, you are more likely to undergo a CT scan because they are more readily available and better at identifying both injuries to the spinal cord and the spine. The MRI scanner itself is a large donut-like machine, generally with a moveable bed inside the hole. An alternative to the lay-down method allows the patient to stand up during the test. There are two rounded magnets that make up the donut. Because MRIs use magnets, they do not have the same potential for harmful radiation exposure that CT scans and X-rays have. The MRI works because the human body is made up mostly of water molecules. The protons within the molecules carry a positive charge and are responsive to magnets. When the first magnet in the MRI scanner is turned on, all of the protons in the body either head towards or away from it. As the second magnet is turned on and off, the protons move back and forth allowing the computer to make an image of your body. You and I can’t feel the tiny protons in our bodies moving, but we can hear a loud knocking sound as the second magnet turns on and off. The technician performing the MRI usually offers to play music to offset the knocking sound. 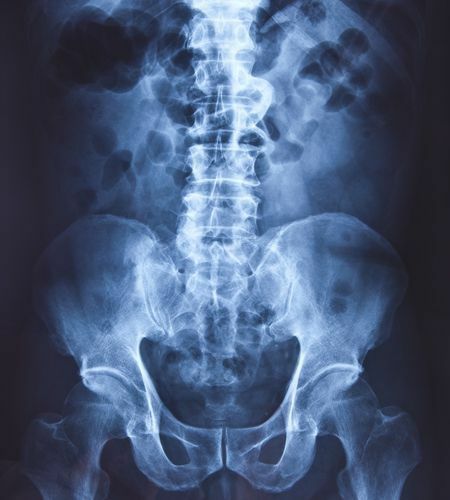 X-ray (electromagnetic radiation) imaging is quick to perform and offers immediate feedback. They are ideal for identifying major injuries to the spine but do not show damage to the spinal cord in enough detail for a proper evaluation. These are best for purely skeletal injuries. X-ray machines send individual particles through the body. Hard parts of the body, like bones or any metal hardware from surgery, block those particles and show up as white on the images. Less dense parts of the body will show in shades of gray. This includes muscles , fluids and organs. Open structures containing air will show up as black. CT (computed tomography) scans are the most readily available and accurate tests done after a spinal injury. They allow medical professionals to see both the skeletal spine and the spinal cord in sufficient detail to pinpoint injuries. A CT scan is a series of X-ray images taken from different angles and combined to form images more detailed than a traditional X-ray. They look a lot like MRI scanners, a donut with a bed in the middle. While you lay on the table, the X-ray tube rotates around you taking images. 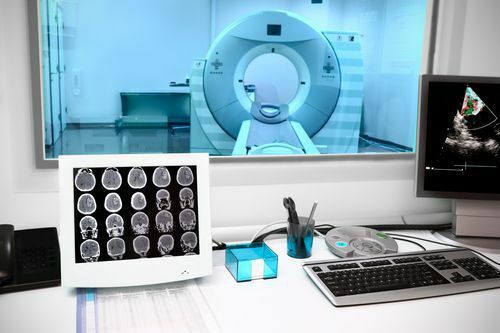 There is a risk of radiation exposure associated with CT scans but many doctors agree the small risk is outweighed by the benefits of the information obtained. Myelogram with CT is often used for patients who cannot have standard MRI due to cochlear implants or pacemakers. The process involves an x-ray exam and a CT scan of your spinal column with contrast dye used to enhance the image of the nerves and space around the bones. Medical professionals can diagnose injury to the spinal skeleton and cord by analyzing the flow of the fluid. If the flow of the dye is blocked or diverts from the natural path, there may be damage to the skeleton or nerves in the spinal canal. This test requires the injection of a numbing substance and a contrast fluid into the back. Some people report feeling ill or flushed, vomiting, headaches and seizures after the injection. Given the risks, many people undergoing treatment and medical professionals prefer MRI and CT scans to the Myelogram.